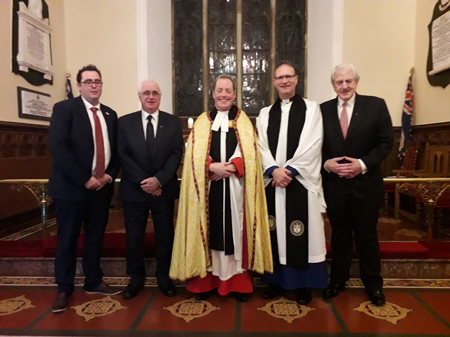 The Lodge of True Friendship 579 Dungannon held their Carol service in St Michael's Parish Church, Castlecaulfield on Sunday 9th December 2018. The Rector Bro Rev Canon Dr Peter Thompson welcomed the many visitors and brethren to the service. V.W Bro Dean Kenneth Hall assisted the Rector. The Rector in his welcome gave a brief insight as to what Freemasonry stood for and of its work and commitment to charity. The 9 lessons were read by readers from across the province lodges 780, 220, 300, 396, 230, 185, 579, PGL the 9th lesson the Christmas Gospel was said by the Rector. The Church choir sang a number of pieces their final Carol being O Holy Night. After the service mulled wine and mince pies were served. The Collection on the night amounted to £700 and this will be divided between TLC and Cancer Choices a local Charity based in Donaghmore.